Briefcase displays provide simplicity in an entirely self-contained portable system. With velcro ready Premier fabric, the ShowStyle and ShowMax brand tradeshow displays simply open for set-up and allow for easy graphic attachment and changing. Add custom printed velcro graphics to enhance your brand. ShowStyle Briefcase Table Top Display Package includes your choice of velcro-ready fabric color, Blank white arch top header sign and Corrugated storage box. 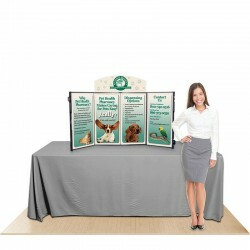 ShowStyle Briefcase Table Top Display Package includes your choice of velcro-ready fabric color, Custom arch top header sign, (4) Custom Velcro Panel Prints and Corrugated storage box. 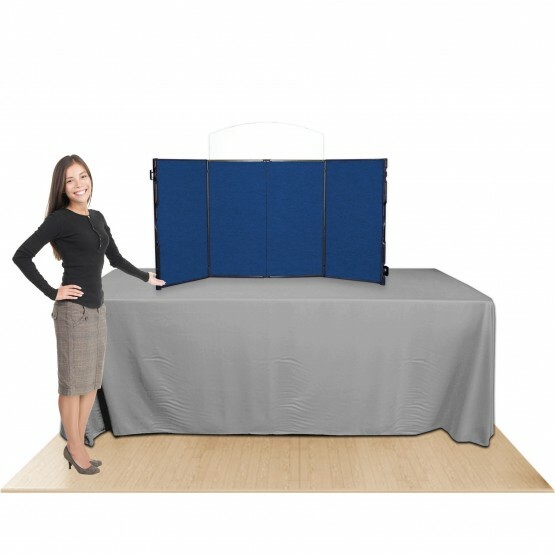 ShowStyle Pro32 Briefcase Table Top Display Package includes your choice of velcro-ready fabric color, Blank white arch top header sign and Corrugated storage box. 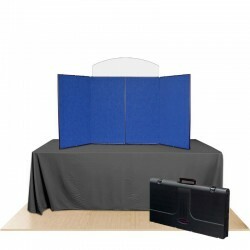 ShowStyle Pro32 Briefcase Table Top Display Package includes your choice of velcro-ready fabric color, Custom arch top header sign, (4) Custom Velcro Panel Prints and Corrugated storage box. ShowMax self-packing Table Top Display Package includes your choice of velcro-ready fabric color, Blank white arch top header sign, (2) Lumstar Halogen lights and Corrugated storage box. ShowMax self-packing Table Top Display Package includes your choice of velcro-ready fabric color, Custom arch top header sign, (4) Custom Velcro Panel Prints, (2) Lumstar Halogen lights and Corrugated storage box. Add Illumination to your ShowStyle brand table top display. 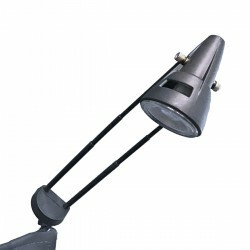 LumaStar LED (12V 5W 6000K) Light Kit with Transformer, Cord and Bulb, retractable arm with slip on base. The ShowStyle and ShowMax brand briefcase table top displays allow you to take your presentation on the road. With the option of three different heights - 24", 32" and 36" - you can choose the best size that works for your branding needs. The durability of the ShowStyle, ShowstylePRO32 and ShowMax display units us unmatched due to the rigid molded plastic exterior which not only protects your investment but also protects your graphics from the hazards of transport due. During storage and transport, your graphics adhere securely with velcro to the fabric panels and can be stored there until you decide to change them out. Eachunit also includes a rigid arch top header sign which mounts on the top of the center panels. You can decide to have this imprinted locally or we can imprint your logo on the header sign so you display arrives ready to use. The best features about the ShowStyle, ShowstylePRO32 and ShowMax displays is quick set up, lightweight for easy travel and the ability for interchangeable graphics. By far the most popular size is the original Showstyle table top display unit. It might be the smallest model available at just 24”, but it certainly stands out and makes an impact in it's own way. Weighing in at only 13 lbs., you'll appreciate the compact size of this briefcase display when travelling since it is considered carry-on size and perfectly slides into aircraft overhead compartments with ease. Each ShowStyle 24" table top display includes a white arch top header with four tabs that enable the presenter to insert the header securely to the top of the center panels on the display. Add optional velcro graphics to further enhance your display. The intermediate size briefcase display, Showstyle PRO32, stands at a height of 32” and nicely fits on any 6ft standard folding table. 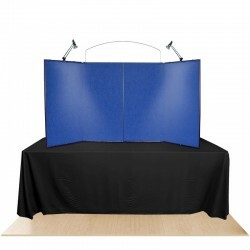 This solid unit provides you with 64” of graphic space to provide trade show attendees with all the information needed about your business or products. Also travel friendly, the 25lb weight of the ShowStyle Pro32 allows you to carry the display through the exhibit halls with ease. 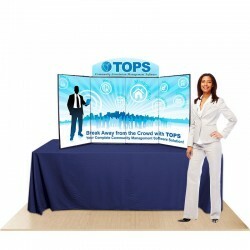 The largest of these self-contained table top displays is the Showmax model. The ample space for displaying your graphics is by far it's most prominent feature at a height of 36" and overall graphic width of 74". Highlight your graphics with the included halogen stem lights and showcase your logo on the white arch top header. As an added bonus, the 2 stem lights and arch header conveniently store in their own molded storage space on the backside of the panels. The enotre display literally folds up like an accordion and is secured with latches for transport/storage. The ShowMax has a handle at one end and roller wheels at the other for easy travel. Weighing only 35 lbs packed, arrive in style with this slim profile table top display! 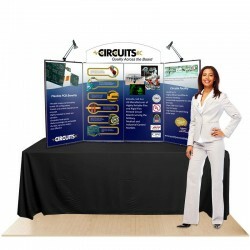 Our sales staff at AffordableDisplays.com is ready to help you choose the right trade show display for your needs. Call 800-723.2050, chat or contact us and get started on your project today!